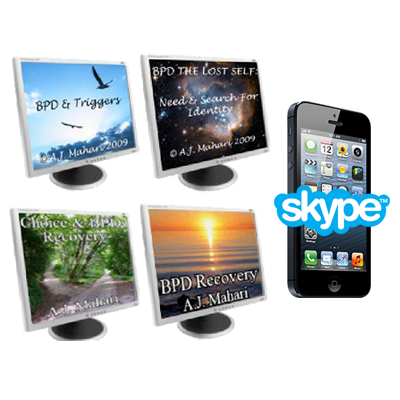 Bundled together in this 4 BPD Audio Package are BPD & Triggers – Gateways To Recovery, Lost Self in BPD – Need and Search for Identity, Recovery from BPD is Possible, and Choice & Recovery From BPD. 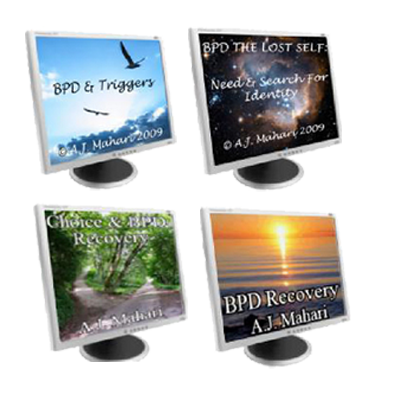 In this audio, Author, BPD and Life Coach, A.J. 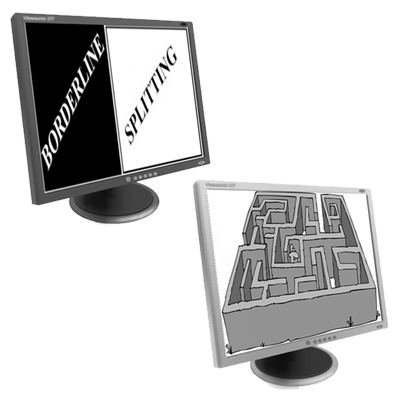 Mahari gives the listener an in depth understanding of Borderline Personality Disorder and the emotional triggers that are so central to having Borderline Personality Disorder. 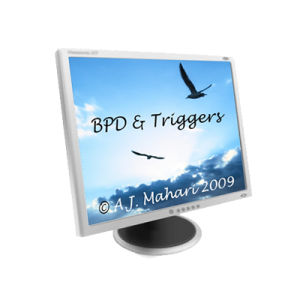 Mahari shares some her experience in how understanding triggers when she had BPD was a pivotal part of her recovery from BPD many years ago. When those with BPD are triggered they experience a sudden increase in distress due to dysregulated emotion. Whether or not the person with BPD is in touch with, or aware of, his or her actual feelings, he or she will experience a sharp increase in emotional distress and discomfort. How that distress and discomfort manifests itself can vary for each person diagnosed with BPD. Central to this experience, however, is the desire and feeling of desperate need to get away from this distress and discomfort by whatever means necessary or whatever actions will provide an escape from the triggered dysregulated emotions. Mahari provides insight into why this escape is destructive beyond the reality that many with BPD seek out self destructive maladaptive ways of coping when they are triggered. Trying to escape the reality of your triggers will only keep you firmly trapped in Borderline Personality Disorder. The more you succeed at escaping the pain of triggered Emotional Dysregulation the more you ensure re-experiencing the same triggers over and over again. Mahari explains how and why this is and what you can do about it. She explains why it is so important to be willing to learn new ways of coping. She also talks about how you can cope effectively with the dysregulated emotion caused by being triggered and all of its accompanying anxiety, panic, stress, discomfort, and distress. Learning to be open to your triggers and the distress of intensely heightened emotion combined with learning healthier and more effective ways of coping is the gateway to recovery from Borderline Personality Disorder. It is the journey from false self to authentic self in BPD Mahari explains just how you can learn to set yourself free from the seemingly endless cycles of borderline triggered emotional dysregulation and all of its suffering. This “psychological death” that anyone diagnosed with BPD experiences causes such overwhelming pain at such a very young age in childhood that there is no way to cope with it. This pain then is effectively also abandoned which coupled with the loss of self creates the need for the rise of the borderline false self that in many ways is at the center of the on-going impact of the core wound of abandonment. 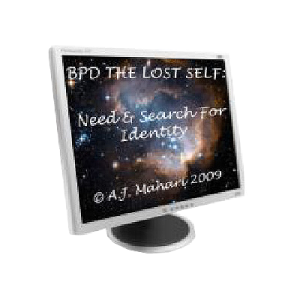 There is a need to actively search for the lost authentic self when you have BPD. 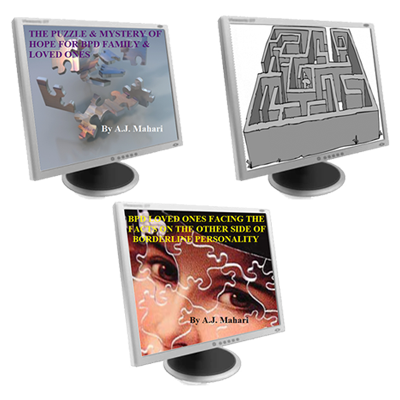 In this audio program, Author and Life Coach, A.J. Mahari explains, from the inside out, the experience and effects of not knowing who you are. Mahari had BPD and recovered but she knows all-too-well what it is like to live without knowing who you are, without being able to answer the question, “Who am I?” Mahari also knows what it is like to lack a stable sense of identity. If you want to know more about what it takes to recover from BPD and how possible that really is then you benefit from listening to A.J.’s motivational and in depth exploration of this lost self in BPD. If you are a loved one of someone with BPD you too can benefit from a deeper understanding of how the lost self and lack of identity in those with BPD drive so much of the thoughts, feelings, and actions of those with BPD that are hurtful to everyone. The self that you have lost, if you have BPD, does not have to remain lost. You really can learn how to search for it and what that means. You really can find your way back to this precious self and to the identity that it holds within it. This is a major part of the work required to take the journey of recovery from BPD The Journey From False Self to Authentic Self – getting in touch with the inner child in BPD. Borderline Personality Disorder is not just the psychological death of your authentic self, and then living without a known sense of self and without a stable sense of identity due to unresolved abandonment trauma. It is also very much about a deep and profound wounding that takes place at your spiritual center on a soul level. Those with BPD often feel out of control and powerless because they are missing this spiritual center. A spiritual center that lives at the center of the authentic self. The lost self and the need and search to find this self and your identity is not only the way to recovery from BPD but it is also necessary so that you can be re-connected to your spiritual center and reclaim your own personal empowerment from the core wound of abandonment that has left you unempowered and feeling or experiencing many aspects of life from a victimization that belongs in your past. To stop re-living that past victimization those with BPD need to find and reclaim the lost self and the spiritual center from which all human beings can truly then empower themselves in ways that those with BPD cannot access. This is the first in a series of audios by A.J. Mahari about Borderline Personality Disorder (BPD) and Recovery. 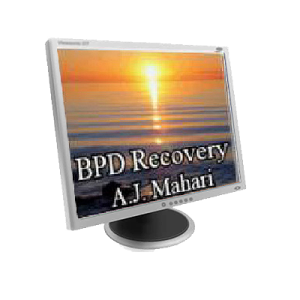 In this audio Mahari talks about the reality that BPD recovery is possible. She talks about what is at the heart of the process that is recovery from Borderline Personality Disorder. This audio which is also an introduction to the series of audios that A.J. Mahari is doing about BPD and recovery is 40 minutes in length. A.J. Mahari is a writer, speaker, mental health and life coach and a woman who recovered from Borderline Personality Disorder 14 years ago. Mahari has been there. Her perspective on BPD and recovery from BPD are truly insightful and from the inside out as someone who has lived the experience of all that she so profoundly describes in her ebooks and audio programs. Having recovered from Borderline Personality Disorder 14 years ago, A.J. Mahari, talks about how and why she made the choice to recover from BPD. Choice is a much larger part of the process and unfolding journey of recovery than many with BPD may realize. In this 1 hour and 15 minute audio, Mahari explains why if you haven’t already made this choice in your own life why it will benefit you and the reality that there is no escaping the pain that you need to face and learn how to resolve and heal in order to recover from Borderline Personality Disorder. Continuing to try to escape your emotional pain will keep you stuck in and with BPD. The very choices that you most need to make may well be difficult to bring to your conscious awareness because with more insight and knowledge about what you need will rise the unresolved pain of your core wound of abandonment. In the battling to avoid this pain – pain that you may not yet know how to effectively cope with in healthy ways – the choice you are making that you may not realize is a choice to stay the same and to continue to suffer. Borderline Personality Disorder compromises your ability to integrate your intellectual understanding with increased emotional awareness. This is why it is important to make a choice to get on the road to recovery and to let that process unfold as it will – as it must – so that you can find out who you really are. A.J. 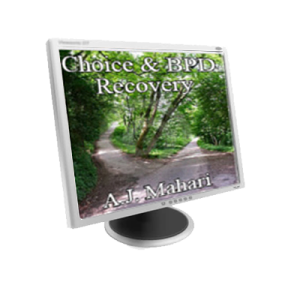 Mahari provides her first-hand experience and insight into how she recognized her choice points in the process of her recovery from BPD and shares with the listener how they too can learn to make new choices that will support their getting on the road to recovery from BPD.